Those living in the midst of the Yankees Gap Road Fire, northwest of Bega, are catching their breath and preparing themselves and the communities around them for the days ahead. Following Wednesday’s flash point, firefighters have spent the hours since conducting back burning operations to slow the spread of the 3000 hectare fire. Three homes and five outbuildings have been destroyed by the flames which many think sprung from routine winter burning on a private property. 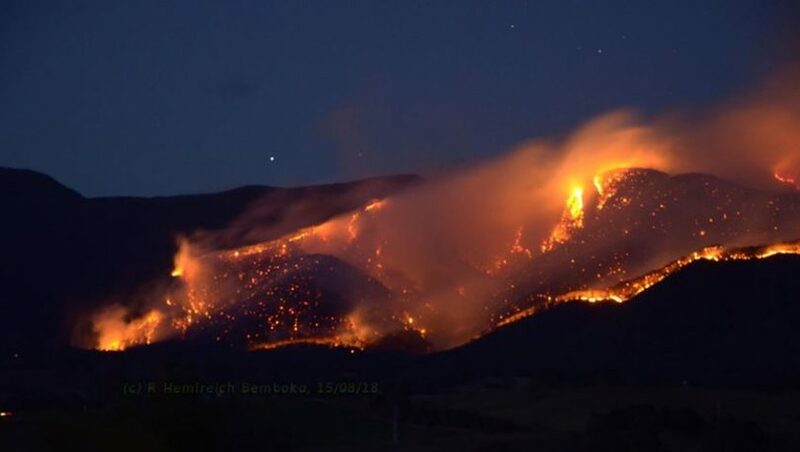 The fire in South East Forest National Park straddles country laneways on the northern side of the Snowy Mountains Highway from Bemboka to Numbugga, with residents towards Brogo ready and keeping watch. Marty Webster from Bega Valley Rural Fire Service says this weekend’s weather presents the next challenge. “We are gearing up for a weekend where the weather will deteriorate and have been strengthening containment lines,” he says. Speaking to About Regional, Fiona Scott says Wednesday’s conditions were terrifying. “The smoke was so thick and we had embers flying and the wind was unbelievable,” she says. “Thankfully we had our fire plan enacted, we had our gutters filled and sprinklers going, the gas bottles moved away from the house, and the cars packed and ready to go. “We live in a timber home in the bush, I don’t expect anyone to save it,” Fiona says. When they did decide to leave Scotland Yard Road on Wednesday night, it was too late. Police who arrived just as they were leaving advised them to stay and seek shelter. “How we did not go up I have no idea,” Fiona says. The paddocks to the west and south of the Scott’s home are black, the bush to the west and north is still on fire and topping up the water tanks for the days ahead is high on the families to do list. Next door at number 85, Lyall and Sharon Zweck are also counting their blessing but by no means feel like this ordeal is over. “The message is do it [preparations] now, you always leave it till you see the smoke, clean your gutters now – don’t wait for summer,” he advises. Lyall is grateful for the support of comrades from Numbugga Rural Fire Service and Bermagui Fire & Rescue NSW who helped defend his home. He says fires in the Brogo area a few years ago were a wake-up call for his family. “We could see the smoke from there and that really made us think we need to have a fire plan,” he says. The fire is still considered as ‘out of control’ with the NSW Government releasing additional funding for firefighting resources in the Bega Valley and Eurobodalla ahead of northwest to westerly winds forecast from Friday afternoon and across Saturday and Sunday. On top of a near zero chance of rain, winds will pitch at between 15 and 50km/hr in the days ahead; at their peak on Wednesday, winds hit 80km/hr in Bega with reports of gusts of up to 140km/hr closer to the fire ground. The season ahead looms large considering the fires of autumn that destroyed 65 homes at Tathra and surrounds and the fires of now – late winter, six weeks short of the traditional fire season in South East NSW. Helmut Eder who lives off Moons Road at the foot of the Yankees Gap Road Fire has built a home he is about to move into, designed to cope with the climate he fears is the future. “Everything is so dry at the moment and it doesn’t take a lot of wind to fan things up, its tough,” he says. “People need to think ahead and actually prepare and ask – what would I do? A sprinkler system, window shutters, and a ‘bunker’ are all part of Helmut’s new house design – he’s not far off moving in. “Why are we still debating climate change?” Helmut asks. Burnt leaves from Wednesday afternoon’s flash point were reported falling from the sky as far away as Tanja, almost 60 km away. “The wind was faster than my camera shutter,” says Bemboka’s Rachel Helmreich. “It’s scary and kind of beautiful, it’s paradoxical. As a new day unfolds, three families are without their home and many more are in harm’s way. There is talk of a community meeting to brief residents but in the meantime, the latest news and advice is available via the NSW Rural Fire Service website. Our thoughts and prayers are with all those battling the fires.